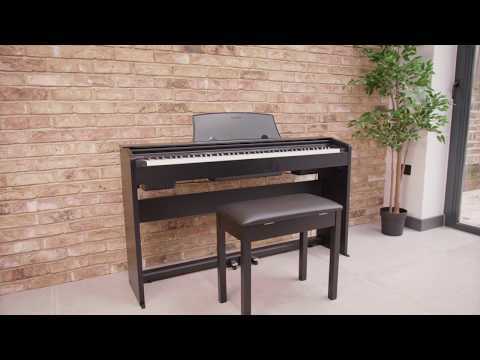 The Casio Privia PX-770 Digital Piano packs in an incredible amount of features suited to the gigging or home musician. With its superb AiR sound engine you can be assured of superior grand piano production and a touch that's equally as impressive. Effects, built in songs and great connectivity options make the PX-770 a very desirable instrument. The PX-770 utilises Casio's Tri-Sensor II Scaled Hammer Action piano keys to give you the expression your performance deserves. The simulated ebony and ivory textures give you a smooth, moisture resistant touch, combined with an innovative hammer action that is scaled across the entire key range, just like that of a grand piano. The Casio PX-770 includes a 16-Watt stereo amplification system. The speakers are conveniently located for an optimal listening experience for both player listeners nearby, and the quality is crystal-clear across the entire audio spectrum so that your performance is at its best. The PX-770's convenient features are useful at home, in a lesson studio, or anywhere else. You can connect two sets of headphones using the quarter inch jacks on the front panel, making the PX-770 ideal for quiet practice. Duet Mode splits the piano into two equal pitch ranges, allowing a student and teacher to sit at the same instrument. The PX-770 has the ability to work alongside the free Android and iOS app Chordana. Chordana Play connects to the PX-770 and teaches you to play in a fun and visual way. Follow the music score or piano roll notation at your own pace, with the app guiding you through each step. Finally, the PX-770 connects via class-compliant USB to any PC, Mac, iOS, or Android device, with no drivers or installations needed, making it a great unit to have as part of your home or gigging set-up.